Here are some of my old clay works! 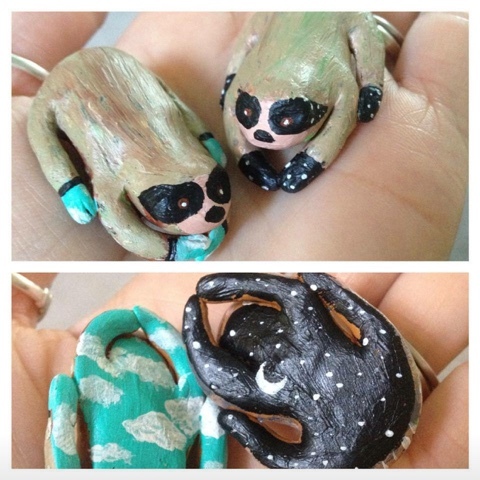 (Which I would love to try remake with colored clay- these are painted) I think one of these dudes was the first thing I sold when I moved back to selling on etsy when I made the animal totem alphabet sculpting one animal for each letter of be alphabet animals a-z (which I recommend as a great project to dive into. It is a good fun thing to really help your skills with sculpting by reading and studying about animals postures, poses and specific details that make them each unique is so worth it!) if you decide to give something like this a try or if you come up with another project to dive into by reading this I would love for you to tag me along in your journey. I have come quite a ways in my sculpting over the past few years. I want to share this with you so you can see that I was not always the best at it, yes some were sloppy some were so difficult I almost gave up but i didn't. I continued sculpting. I worked hard and believed in myself to get my art to where it is today, and guess what it? It will even get better from here! it's a constant work of learning and expanding to new levels of making awesome things even more awesome. Please continue to follow your heart your dreams and keep making what you want... PLEASE keep at it, keep going, keep trying you will make mistakes you will get frustrated. Trust me I have started over countless times in one piece- (sometimes taking a break from it and coming back to it with fresh eyes helps greatly!) Don't don't give up on yourself. Keep doing what you love making what you make be it art or music or ANYTHING, please follow your heart and the rest will follow. I love you all and thank you for being here with me.